Punahou encourages clothing and hairstyles that are neat, clean and appropriate in a school setting. Footwear is optional for students Grades K to 6 except on field trips and excursions where appropriate shoes or slippers are required. On the web-page entitled "Philosophy" there are about 30 kids standing in front of their classroom (holding up flags they have made). Sure enough, every last one of them is barefoot!. At their website go to the index and look up Dress Standards for Lower School. Boys and Girls wear shoes and socks, sandals with backstraps, or go barefoot. Shoes are mandatory for field trips. Slippers, including flojos and sandals without backstraps, are not permitted. 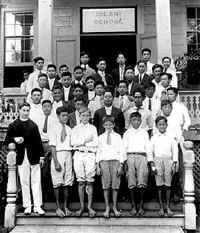 Iolani School has a long tradition of allowing bare feet. ... "Well, from what I've seen in schools here, most elementary schools are footwear-optional, public and private (except those that have uniforms)."